Clearly A Cyborg is licensed under a Creative Commons Attribution 3.0 Unported License. Permissions beyond the scope of this license may be available. Posted to Flickr on 16 November 2010. For those curious about my cyborg parts, last week I had my second set of implants x-rayed and got a copy of the results. First, for those who don’t know, I really am a cyborg. I have a spinal cord stimulator implanted in my body to help control chronic migraine headaches. This is my second set of implants which replaced the first set after it was determined that at least one of them had come loose and was no longer effective. So … back to this x-ray. You’re looking at the back of my neck and through my open mouth. The upper gray mass is my upper jaw. The lower gray mass in my lower jaw. You can probably make out some of my metal fillings. The series of dots in the middle are pins that make up my two electrical leads. Each of these pins can potentially arc electricity to another pin, which is how the implants work. They send electrical "white noise" into the nearby nerves, masking headache pain. When my technician creates programs for me, she is selecting certain pins at certain power levels and certain frequencies. You can also make out the wires leading downward. 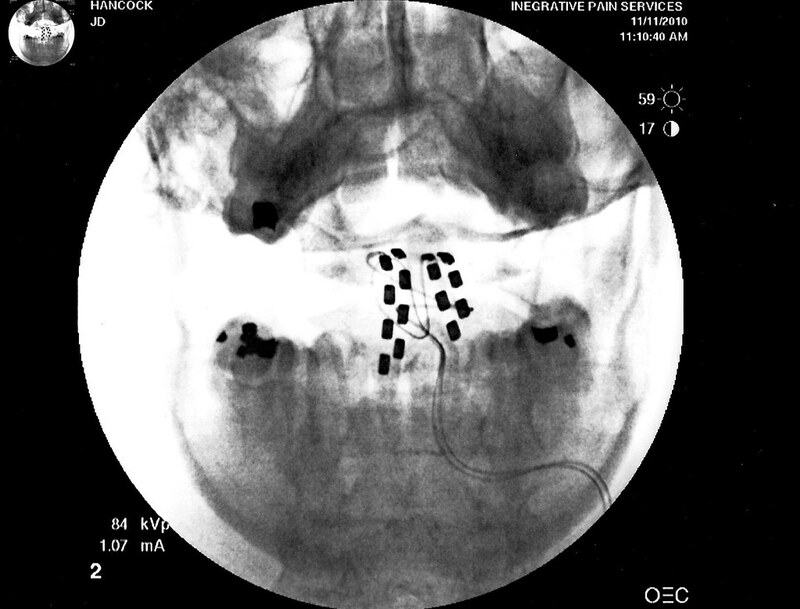 They terminate in a main battery unit implanted in my lower back (not shown). I charge this unit with an external battery several times a week. This photo was posted to Flickr on 16 November 2010. The last time I checked, it had 11,724 views on Flickr. The media type of this image is "photo." The original file type was "jpg." The photo's dimensions are 1024 x 780, giving it landscape orientation. Clearly A Cyborg by JD Hancock is licensed under a Creative Commons Attribution 3.0 Unported License. Permissions beyond the scope of this license may be available.